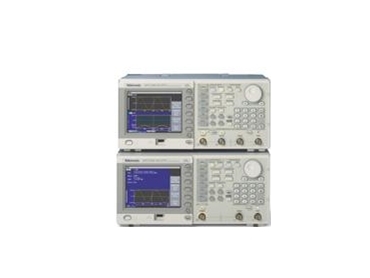 Tektronix, Inc, a leading worldwide provider of test, measurement and monitoring instrumentation has released AFG3000 Series of Arbitrary/Function Generators (AFG). The AFG3000 Series of arbitrary/function generators consists of six models whose ease-of-use and performance establishes a new benchmark in the value category. With the AFG3000 Series, engineers have a powerful function, pulse, and arbitrary waveform generator to shorten test time and reduce time from design to market. Customers in a wide array of industries are working on new electronic circuitry of increasingly higher speeds. The design and test of this circuitry often requires one or more simulated input signals from a missing or difficult to obtain component or sensor. These signals can be as simple as an audio frequency or clock signal or more complex such as a serial data stream or signal from an airbag sensor during a crash. Arbitrary / function generators are often the instrument of choice, but users routinely outgrow the capabilities of existing test equipment. Due to an innovative architecture based on a powerful Generator on a Chip (GoC) ASIC, the AFG3000 Series delivers industry-leading performance in its class. At the same time, the platform’s user interface is straightforward and easy to use, and provides a large available display, all maximising productivity. Even with these compelling advantages, the instruments in the AFG3000 Series are priced below competing offerings. The six models that comprise the new Tektronix AGF3000 Series address the problem for engineers, who need to test electronic circuits with one or more signal inputs and sine waveforms at frequencies up to 240 MHz, generate arbitrary waveforms up to 2 GS/s, obtain up to 1 ppm clock stability, and who desire an intuitive graphical UI. For applications requiring signals with sampling rates of 1GS/s or more, the AFG3000 Series can save users up to 75 percent of the cost when compared to many alternative high performance products. The models at the top of the series will appeal to designers developing high-performance computing or communications equipment and video products. The more basic models will attract users in colleges and trade schools, as well as designers of consumer electronics, medical and automotive systems. According to Tektronix, the AFG3000 Series offers unprecedented performance and ease of use at a attractive price. Tektronix is committed to innovation in signal sources that will provide its customers with the ideal instruments in the market. The AFG3000 Series is a major development towards this goal, a serious problem solver providing customers with compelling advantages that transform the arbitrary/function generator market. According to Texas Instruments, they have reviewed one of the new AFG 3000 series units and it has many compelling attributes including good performance and the ideal user interface they have seen in this class of instrument. The 5 ns edge time in the AFG 3102 for square waves and pulses is ideal in class. Like similar instruments, it is really three products in one, providing many attributes typical of function generators, pulse generators, and arbitrary waveform generators. What’s different about the Tektronix AFG 3000 is that it excels at more of these than any other single product. The AFG 3000 Series represents significant advance in the arbitrary/function generator market for many, many years. A common frustration with existing instruments is that the operation of the instrument is often difficult to learn and easy to forget. Across all industry segments, customers have expressed that ease of use is their main concern about existing equipment. Since arbitrary/function generators are typically used only on occasion, customers have to relearn the instrument operation. This results in impaired productivity. Operation of the AFG 3000 is easy to learn due to the large display in the industry and intuitive user interface. Users will appreciate that the AFG 3000 Series is just as intuitive as the popular Tektronix TDS 1000 and TDS 2000 oscilloscope series, allowing them to focus on design tasks and improving time to market. According to Prime Data, the new Tektronix AFG3000 Series signal sources are usable, versatile and offer a strong value proposition. Dual channels, increased performance, and a great display open a lot of possibilities for new applications and even replacement of multiple pieces of equipment. The easy to understand and navigate user interface will help users to better concentrate on the problem and not on the instrument setup. The AFG3000 Series is a big step forward for signal sources. The ArbExpress 2.0 software package extends the ease of use to the creation and editing of arbitrary waveforms on a PC. ArbExpress 2.0 seamlessly translates oscilloscope data from all popular Tektronix oscilloscopes and also enables direct transfer of waveform data out of the MathWorks MatLab software that eliminates tedious conversion and modification. The software also allows the building of equations with ease, using interpreter-based logic and a wide range of functions. This enables customers to spend more of their valuable time on their original task and less on learning and re-learning instrument and software usage. ArbExpress 2.0 is available without charge. The architecture of the AFG3000 Series is transformational with the integration of Generator-On-A-Chip technology. This custom waveform generator ASIC enables good price/performance and the compact form factor of the AFG3000 Series. In a single CMOS 0.18 micron IC, the Generator-On-A-Chip provides Direct Digital Synthesis (DDS), a Digital-to-Analogue Converter that operates up to 2 GS/s, provides true 14-bit amplitude resolution, the ability to synchronise multiple channels, category leading memory for arbitrary waveforms, standard function generator waveforms, pulse generator with variable period and independently adjustable rise and fall times, modulation source, noise source, burst capability, and frequency sweep. A single ASIC within the AFG3000 Series provides all of these functions, enabling engineers to address a multitude of design tasks today and into the future. AFG3000 series of arbitrary/function generators are available from TekMark .